South Korean army soldiers patrol at the border villages of Panmunjom in Paju, South Korea, April 11, 2018. South and North Korea are discussing plans to announce an official end to the military conflict between the two countries that are still technically at war, the Munhwa Ilbo newspaper reported, citing an unidentified South Korean official. At next week’s summit between South Korea President Moon Jae-in and North Korea leader Kim Jong Un, the two neighbors may release a joint statement saying they will seek to ease military tension and to end confrontation, according to the report. A direct phone line between Moon and Kim may be connected around Friday, Moon’s chief of staff, Im Jong-seok, told a briefing Tuesday, adding that it hadn’t been decided when they would hold their first conversation. No peace treaty has been signed to replace the 1953 armistice that ended the Korean War, and the U.S. and North Korea have been at loggerheads since formal hostilities ended. A successful summit between Moon and Kim could pave the way for a meeting between Kim and U.S. President Donald Trump — the first between a sitting American president and a North Korean leader. The peninsula remains bisected in a perpetual stalemate, with the U.S.-backed South Korean military lined up against more than a million North Korean troops. While tensions have occasionally flared, the two sides have so far staved off another devastating conflict. Some of the issues that would have to be tackled include the hundreds of thousands of troops along one the most heavily fortified borders in the world; submarines and ships patrolling on both coasts; South Korea’s active military alliance with the U.S; the hosting of U.S. forces; and North Korean artillery pointed at Seoul. 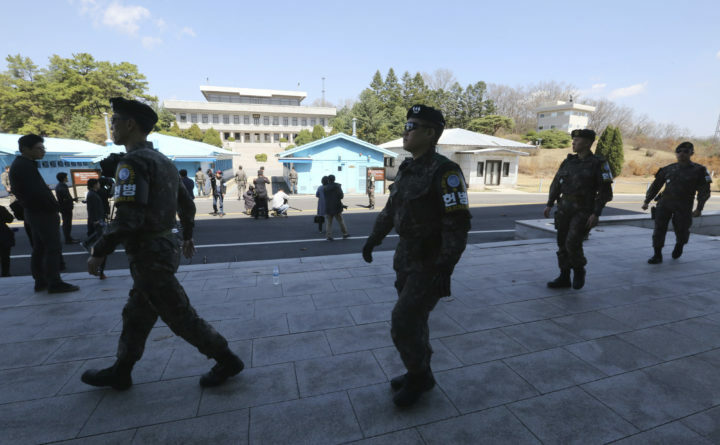 One way to resolve the conflict could involve returning the heavily fortified Demilitarized Zone to its original state, the Munhwa Ilbo newspaper said.